This past January, Anuta Networks came out of stealth at Cisco Live in London, showing off their nCloudX platform, an SDN controller aimed at multitenant cloud providers. Anuta’s nCloudX controller can manage hardware common to many networks. As such, Anuta isn’t forcing providers to install OpenFlow switches, build a tunnel fabric, or otherwise disrupt their production environments to gain orchestration and services management. The nCloudX controller abstracts commonly deployed network routers, switches, firewalls and application delivery controllers, along with traditional tools like BGP, OSPF, MPLS and VRFs. Cloud operators and as well as cloud consumers can provision the network using predefined templates that remove the need to individually configure the underlying network hardware. In this webinar, Anuta will walk through the key elements of nCloudX, and then proceed with a product demonstration. There will be time for Q&A at the end. The webinar is free, and registration open to all. 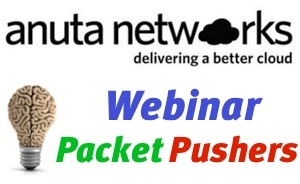 Ethan Banks and Greg Ferro will keep the webinar flowing in Packet Pushers style, getting to the nuts and bolts of how nCloudX works, fielding your questions, and making sure you walk away with a good understanding of how Anuta can fit into your environment.